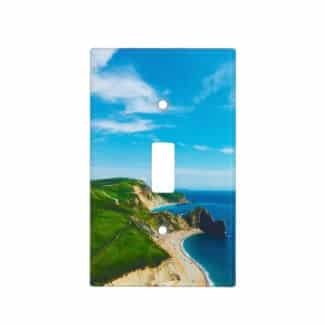 This light switch wallplate features a beautiful photo of the ocean shoreline, cliffs, beach, green hills, and pretty blue sky with wispy clouds. Great for an ocean, beach or nautical themed bathroom or other room! Click the “Buy on Zazzle” button below to purchase or view more details in my Zazzle store on Zazzle.com. Amazon Links: This site is a participant in the Amazon Services LLC Associates Program, an affiliate advertising program designed to provide a means for us to earn fees by linking to Amazon.com and affiliated sites. 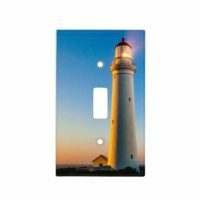 Other Links: This site also participates in affiliate/referral programs with other sites such as Zazzle.com and others that pay us a commission on resulting sales. Please understand that I only link to items & services that I myself have used or would use. When I come across an item or service that I think could be useful to my readers, I provide a link. In the case of links on this site that point to categories on other sites rather than specific items, obviously, I don't have direct experience with every product shown on the linked site. Any fees earned enable me to spend more time and money making this site better for my readers.